The other day I saw something come in via the net about a top 50 IT blog list from Biztech Magazine, so being curious I clicked on the link (after making sure that it was safe). To my surprise, I saw my blog (aka Gregs StorageIOblog) listed near the top (they sorted by blog name order) of the top 50 IT blog sites that they listed. Im honored to have been included in such an esteemed and diverse list of blogs spanning various technologies, topics and IT focus areas. Congratulations to all that made the list as well as others blogs that you will want to add to your reading lists including those mentioned over on Calvin Zitos (aka @hpstorageguy) blog. 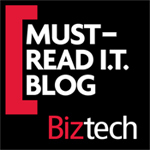 Check out the top 50 IT blog list here.